3.5x4 Customized Indoor Magnets 55 Mil Square Corners are specially made to let your brand message read by customers/clients every day. They can be placed on any metal surface at home including shelves, refrigerator doors, locker etc. they have extended life and strength due to the 55 Mil thickness. Made In USA, these custom magnets are provided with square corners to make them look sharper. Order this custom square and rectangle magnets today to grab our free design, full color processing, lowest price guarantee, and free shipping offers. 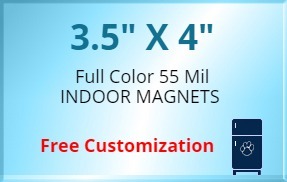 Request a quote to know wholesale savings for these 3.5x4 Customized Indoor Magnets 55 Mil Square Corners.